Orthognathic, or reconstructive jaw surgery is a procedure that corrects problems with the form and position of the upper and lower jaw bones. Who may need reconstructive jaw surgery? Those with congenital jaw problems, developmental problems with the jaw, or jaw deformities such as cleft lip or palate. Those with severe over/under bites that are caused by excess or shortage of jawbone tissue. 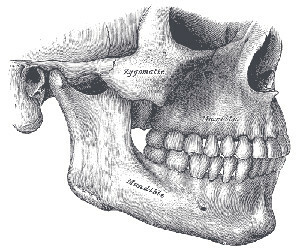 Patients who suffer from traumatic facial injuries affecting the jawbones. What does reconstructive jaw surgery involve? Reconstructive jaw surgery can be performed on the lower or upper jaw, and the surrounding facial area. During the surgery, patients are normally put under general anesthesia on an in-patient basis. Our Raleigh oral surgeon cuts the jawbone using osteotomy, the procedure in which the bone is cut to change length or alignment. He will permanently re-position the jaw and stabilize using titanium plates, wires and screws to hold the jaw in place. Arch bars may be used sometimes for more stability and support. Distraction: the jaw area is slowly expanded until the new or re-positioned jawbones grow together. Bone graft: Bone grafts are necessary for people who suffer from jaw infections or bone deficiencies. Having an improperly aligned bite can jeopardize the health of the teeth and gums. The jaw joint can also be affected by a jaw mal-relationship. If the upper and lower jaws are different sizes, it can affect appearance. How is unequal jaw growth corrected? Reconstructive jaw surgery can mean rearranging all or part of the upper and/or lower jaw into a better position, like moving the jaw backward if it’s too large. Treatment should improve the jaw’s function and restore facial balance. In cases of facial abnormalities in the upper face, cheekbones, or nose, those can be surgically corrected by our maxillofacial surgeons by re-positioning the bones, making the facial features more symmetrical. After the jaws are corrected, rubber bands or wires may be attached to teeth to hold the jaws together during the healing process. Rigid, internal fixation with miniature screws and plates might also be used to allow the jaw to open and close sooner after reconstructive jaw surgery.